In a unique initiative, aimed at exposing students to experience the traditional rural and hard life of the farmers, the students of Aspire Junior College, a private college of Udalguri were given a never before seen experience of planting seedlings in the paddy field. 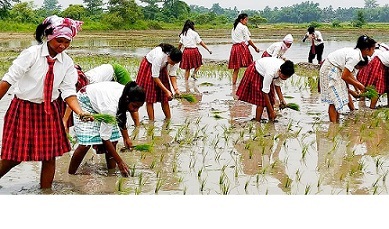 In a recent activity, the students of the college, both boys and girls alike, donning school uniforms, were taken to a paddy field in Sapekhaiti village near Udalguri town where they delightfully participated in planting seedlings like the village folks. “The initiative is a part of making the young generation learn their traditional roots and culture along with making them experience the rural livelihood,” said principal of the institute, Maihursa Boro. He further stated that in this world of rat-race competition, digitization and globalization, the human minds are confined to digital screens of mobile, televisions and computer. “So, we have given an effort to give real life experience of the traditional rural life to the students and the students are elated to be a part of such activity,” said Boro.